The post “The Day We Almost Died” was the last part of our adventure. Camping, on the other hand, was there waiting for us every night. 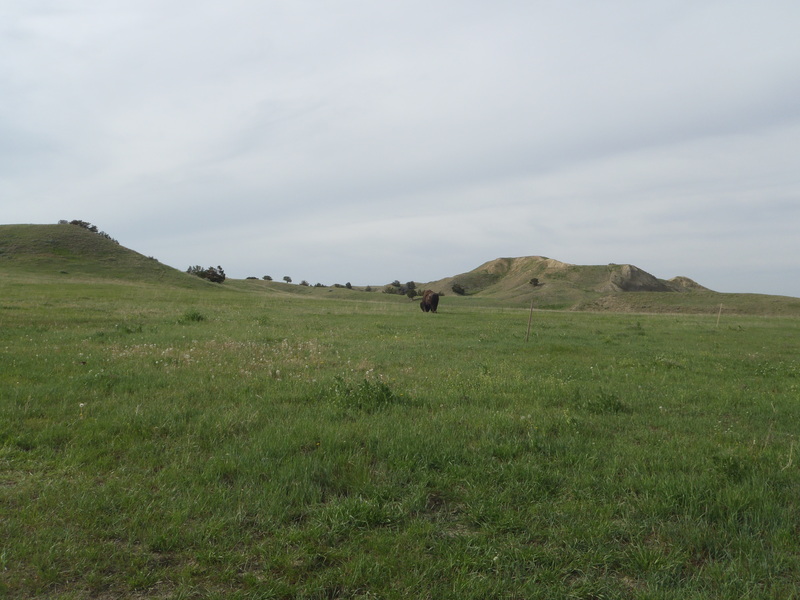 We left my house early on May 17th, and drove all day to the Badlands. Along the way, I got a speeding ticket (the first!) in Wyoming which was ostensibly because I just wanted to get the heck out of Wyoming as fast as possible. 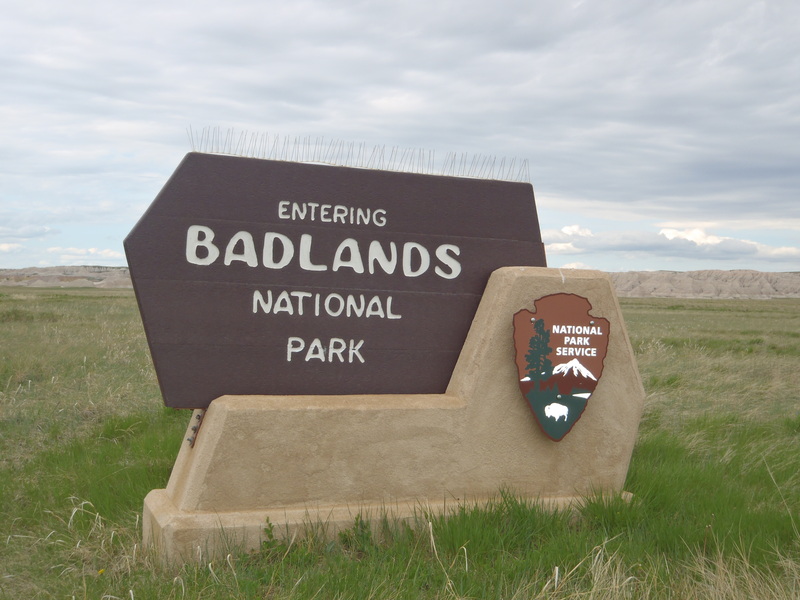 There were a few hold-ups, including construction, and we arrived in Badlands National Park about an hour and a half later than I had anticipated. Then it took even longer to get to the campsite, because AAA gave me directions to the main entrance and not the Wall entrance, so we ended up backtracking quite a bit. It was, however, a fun adventure in and of itself. 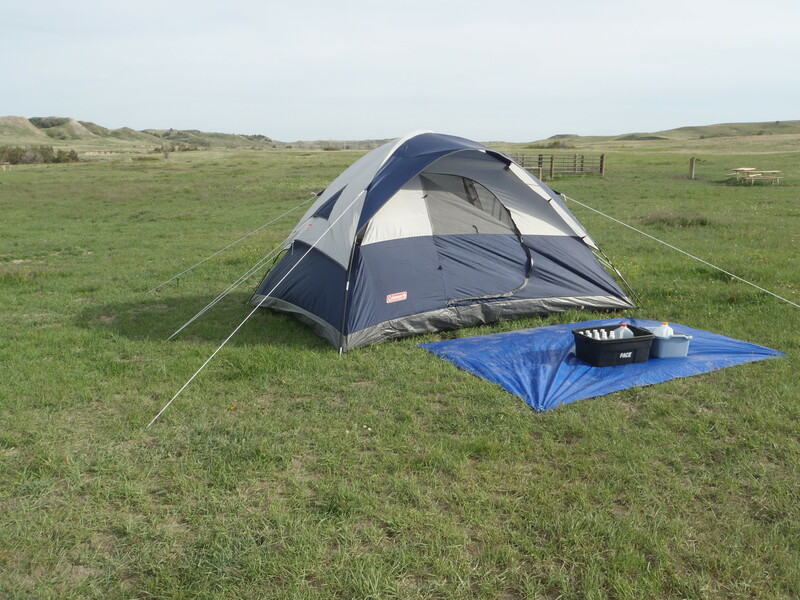 Although you can camp anywhere you like as long as you’re out of sight of a road or trail, we decided to go for medium woodsiness and park at the rustic/primitive Sage Creek Campground. It has posts, and a dirt road, and pit toilets. My tent was new so it took us a little while to figure out how to put the thing together; my friend probably did most of the figuring out. Once we got it all set, though, it was home sweet home. A mansion, really, as far as tents go, because it’s a six person tent and there were only the pair of us. To be fair, though, tent capacity advertised is actually one or two people more than can actually fit comfortably. Something we did not realize would be the case in our campground was the neighbors. 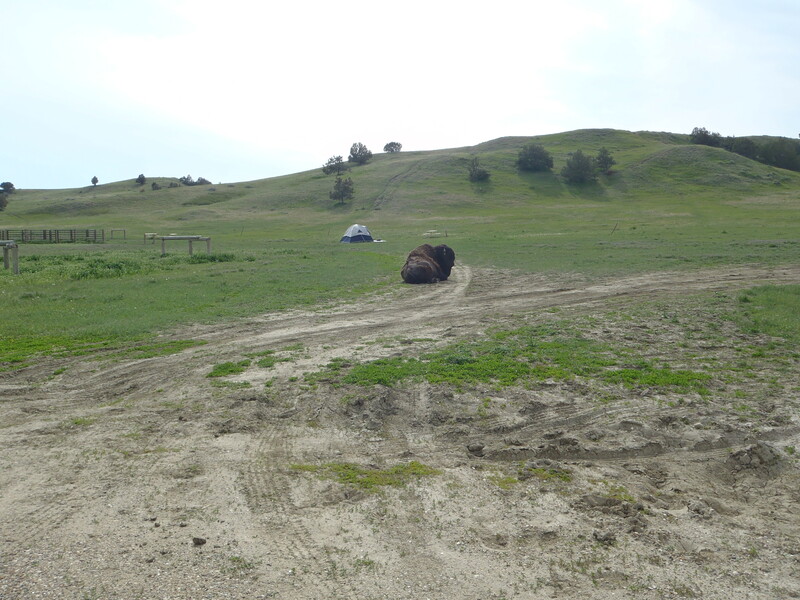 We were not expecting so many fellow campers, so we chose a spot farther away from the main tent sites and nearer to the horse corral. We were banking on no horses showing up, and we were right. There were a few vaguely obnoxious human neighbors, but most people only stayed a night or two. We stayed four nights! 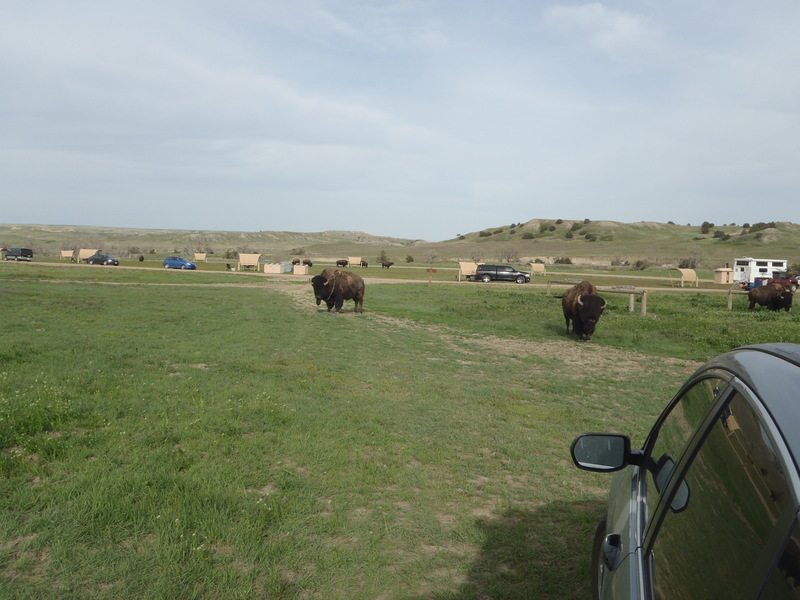 No, seriously, the bison get close. Mouth-Breather seen here, maintaining a respectful distance during waking hours. Eventually, though, we got used to our new neighbors and carried on calmly with our tasks. 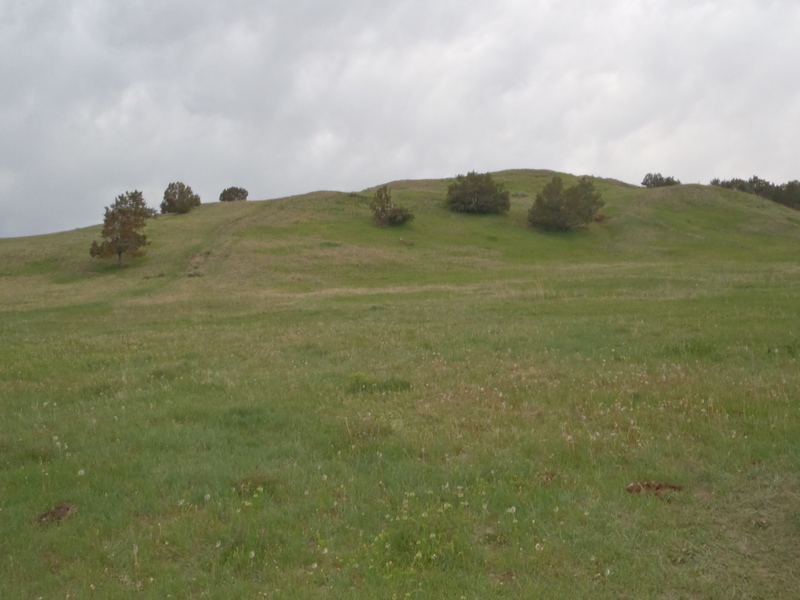 We spent most of the days away from the campsite hiking and exploring, but there was one day where we hiked all morning in the area around us, and then came back in the evening to explore Sage Creek. 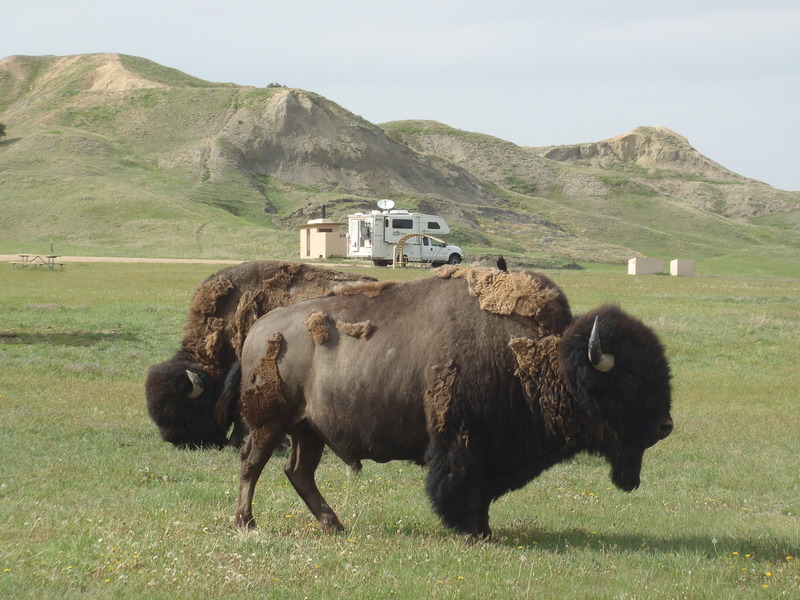 Sometimes the bison blocked us in, sometimes they blocked us out from driving to our tent. …and blocked us in. Bison! But mostly we were able to carry on undisturbed in the evenings. 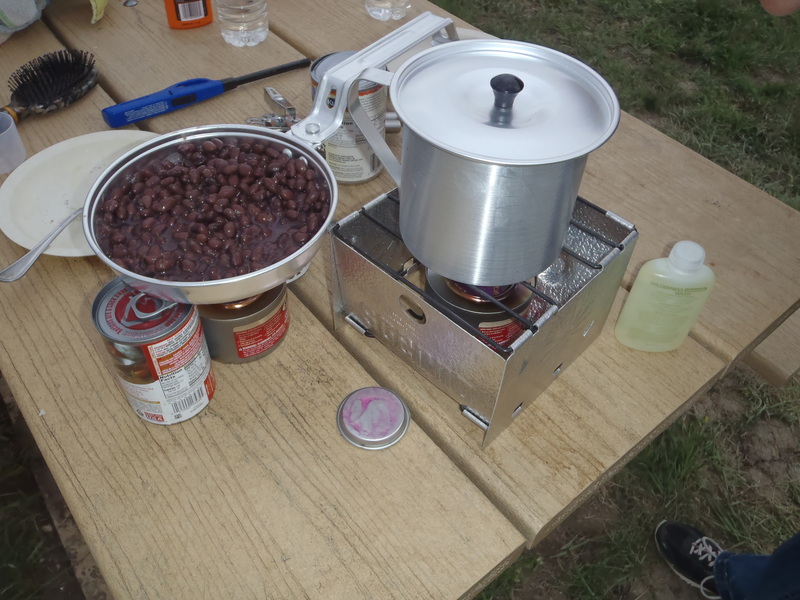 Our favorite tasks were using camping sternos and stoves to half-cook rice and beans (for burritos), soup, quiches, eggs, and other simple foods, as well as spitting on bison plops when we brushed our teeth, and urinating 20 feet outside our tent in the middle of the night. 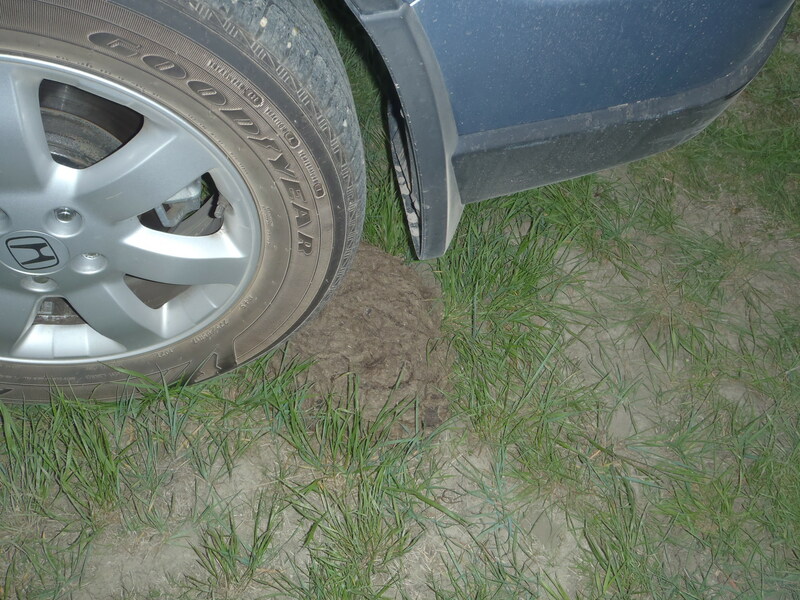 Unrelated, but I came dangerously close to backing onto a bison plop. Skill! We were making burritos. They were actually pretty good! No seriously, it was so dark that no way were we going to walk alllll the way to the pit toilets just to tinkle. We couldn’t see our hands in front of our faces, let alone our neighbors so we were sure they wouldn’t see us. And it was great. We also took hobo-showers with bottles of water and mostly waterless shampoo and soap. It felt very rugged. Also at night were the coyotes howling and yowling across the valley. That part was cool. There was also a symphony of frogs chorusing. It made sleep very peaceful. 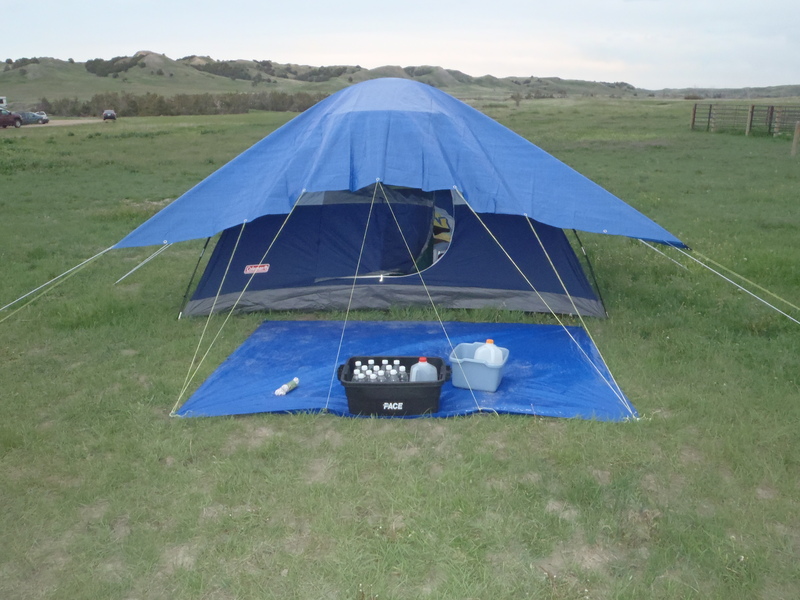 We did put a heavy duty tarp over our tent, just in case it rained heavily. There were a couple nights with a few drops of rain, but the last night it was a downpour. Cleanup wasn’t fun there, but it turned out okay. Now that it’s been almost a month, I seriously miss camping. I’ll have to go again! 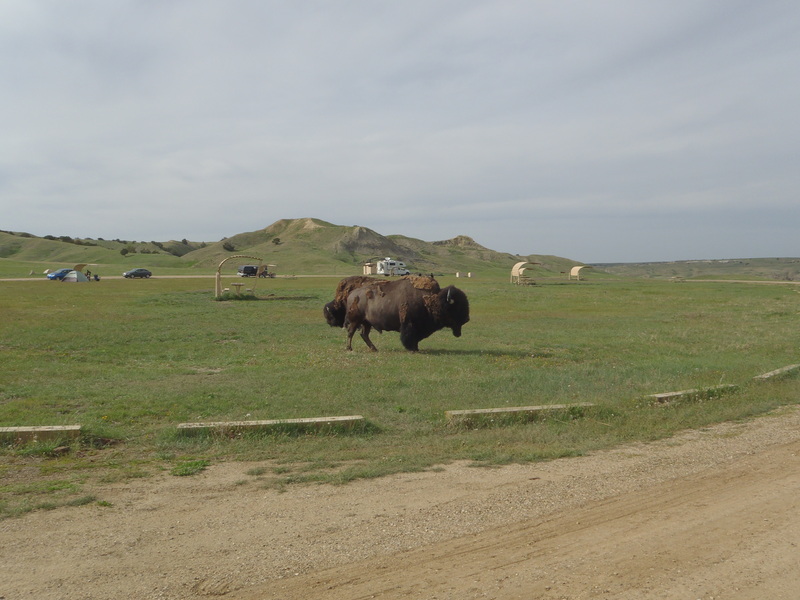 Next up: Animals in the Badlands, Hiking and Scenery in the Badlands, and Wind Cave National Park. 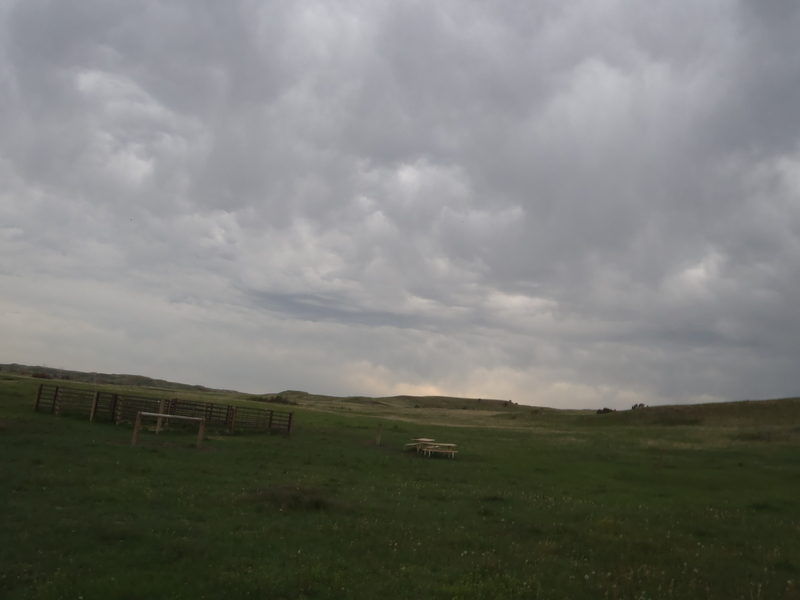 This entry was posted in Little Adventures and tagged badlands, big adventure, bison, camping, great memories, little adventures, national park, photo diary, photos, pictures, roughin it, Sage Creek Campground. Bookmark the permalink.